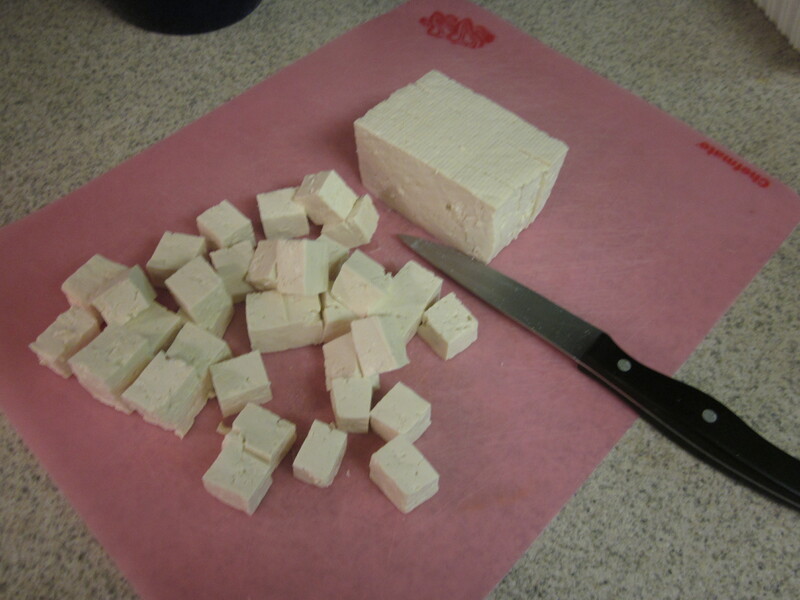 But I finally overcame my fear and decided to try making tofu. 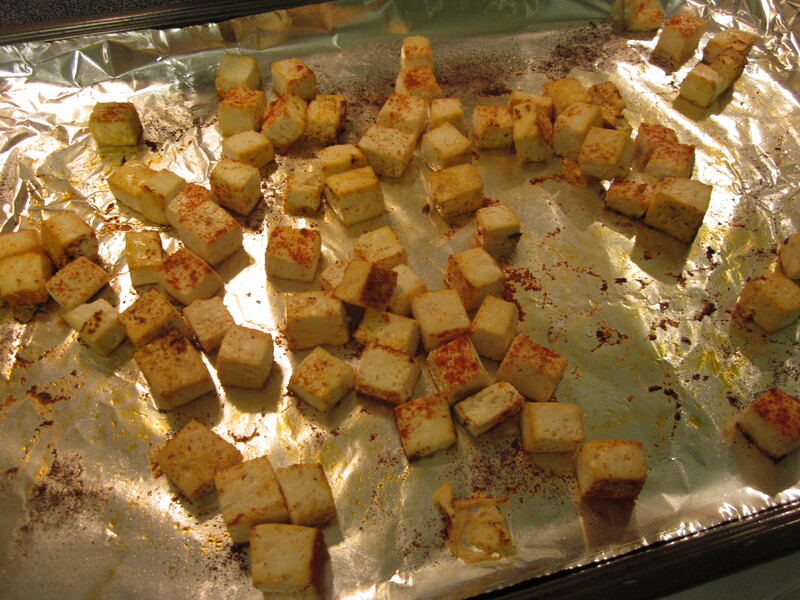 The first recipe I used called for cubing the tofu, covering it in flour, and then sauteing it. I ended up with a slimy disgusting mess. Nope, not it. Then I found a recipe that called for baking the tofu. That seemed more my speed. So bake I did and I’ve never looked back. Here are my tips for baking tofu quickly – the whole process takes less than 30 minutes from start to finish (‘draining’ time included). I always buy extra firm tofu – the brand doesn’t matter (to me). When I’m ready to prepare dinner, I preheat the oven to 425 degrees. 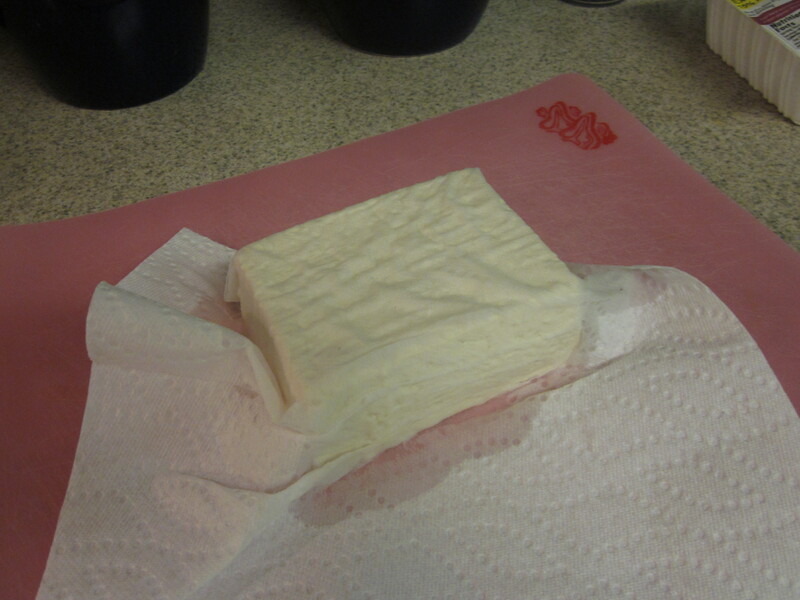 While it’s heating up, I take the tofu out its water-filled package, place it on a cutting board, and use paper towels to ‘drain’ it. It takes quite a few paper towels (shhh… don’t tell the environment) but it works and it’s quick. Press firmly (but not hard, you don’t want to destroy it!) on every side of the tofu until your paper towels are no longer getting soaked with water. This is a guesstimate. Then, I cut it into roughly 3/4 inch cubes. I prepare a baking sheet by covering it with tinfoil (for easy cleanup) and spraying the tinfoil with nonstick spray. 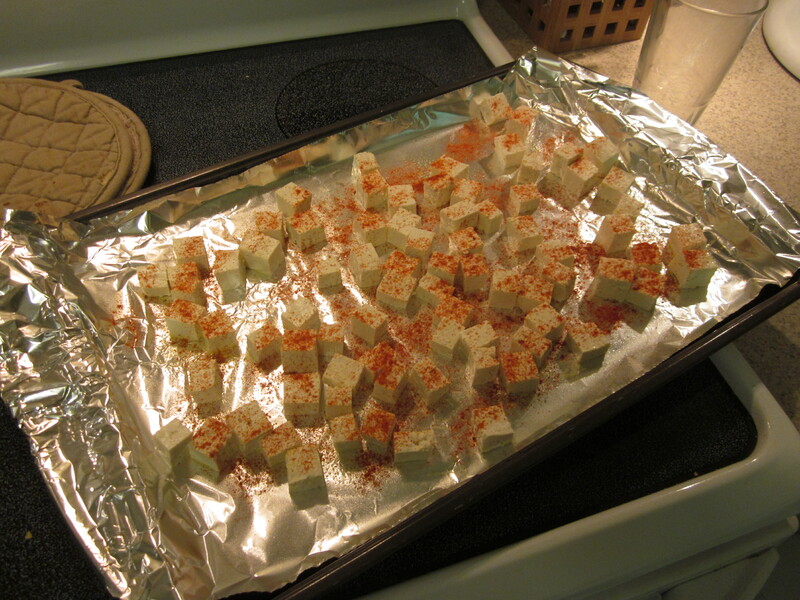 Then I distribute the tofu evenly across the sheet, spray it with the nonstick spray and sprinkle all of it with paprika. Then I bake it in my pre-heated oven for roughly 15 minutes at 425 degrees. It’s done when the outside is just a little crispy. The inside should be soft but cooked. This tofu goes really well with one of my favorite recipes of all time: Curried Couscous with Broccoli and Feta. And that’s how easy it is to make tofu!